Can you believe that this Saturday is the first day of summer? I sure can’t. Since fall will be here before we know it (and my maternity leave will be over before I know it), we need to take full advantage of these long, warm days. I’m quickly realizing that being on maternity leave in San Diego during the summer means that there are a lot more people everywhere I go. It’s slightly annoying. At first I was wondering what everyone was doing at the park/mall/zoo/on my walks… it would be 10am on a Wednesday. Don’t these people work?? It’s been sooooooo long since I’ve been off during the summer to see that some people actually have a summer break. Charlotte and I (and Matt when he’s not working) will be found doing the following things over the next couple months, with everyone else who is lucky enough to have these summer days off. I don’t know whose pool we’ll be crashing, but Miss Charlotte has been begging me to put on her bathing suit (and hat and sunglasses) so she can put her little piggies in the water. I’m a firm believer that the beach sounds (and looks) more fun than it actually is, so I’m not a huge beach-goer. 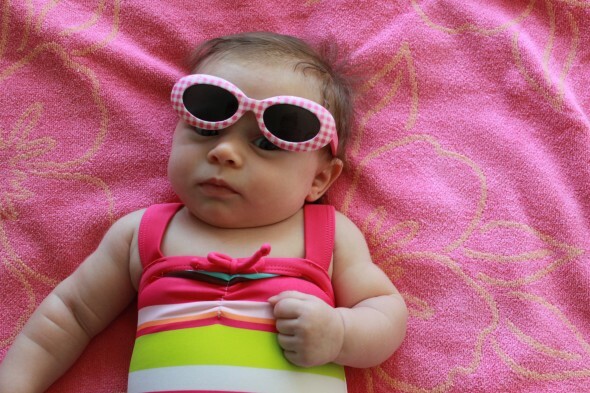 BUT, what kind of parent would I be to not take Charlotte to the beach at least once during her first summer?! We got a membership to the zoo, so we plan on being regulars there. I love getting out of the house and I force us to go to one place each day- I WILL go stir-crazy if I’m kept inside all day. The zoo may or may not be our place 2-3 times per week. Although the membership is more for me (I work out, Charlotte sleeps), she’ll eventually learn to love the zoo and seeing all the animals. Seaport Village is so close in proximity to us. Although it’s a large tourist destination and we tend to stay away, I plan on going down there a couple times this summer. First off, I need to change up my walks. Walking the same grounds day-in and day-out can get pretty old pretty quickly. Secondly, the shops at the Village are fun to walk through… perhaps the fudge shop will call my name when we’re down there. And then I’ll walk off the fudge while walking around the harbor. We haven’t been to the fair in FOUR years! Every summer I say we’re going to go and we just don’t make it. There always seems to be something… getting married/going on our honeymoon, Matt’s work schedule, out of town, etc. This year we just might make it. Although I’m not entirely certain we will. At least there’s always next year. This is just a must if you’re in San Diego in the summer. Maybe we can catch a Sunday afternoon game on the lawn. Although Charlotte won’t remember any of this summer or any of these activities, I’m looking forward to some family adventures and hopefully finding a couple activities that can turn into annual summer traditions. I have not been to that Donut Bat yet, … anytime you want to walk over there, … call me. I’ll join you! 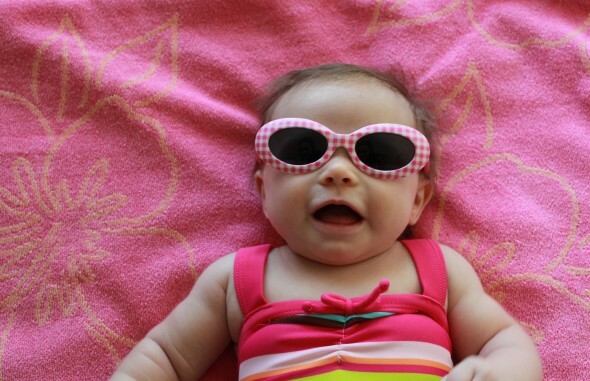 The bathing suit and sunglasses look great on her! She’s a natural California girl. Oh my gaaaaa! So precious…and everything sounds like so much fun!